SNES Super Demo World: The Legend Continues (v1.1) "warps" in 19:38.48 by JXQ. This game is a very well done and thorough hack of Super Mario World, adding an entire new set of levels, a new world map, and even ASM-coded several other interesting features into the game's engine, such as a blue block that can only be broken with firepower. 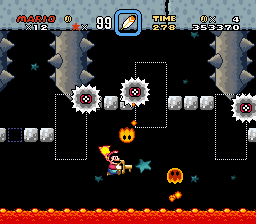 The layout of the game takes full advantage of both the mechanics of Super Mario World and the additions of Super Demo World, and the levels can get extremely complicated. The homepage for Super Demo World, including the patch against Super Mario World, is available online.